This book was on my TBR stack for several years. I picked up a copy, probably 2 years ago, and then it just sat there. 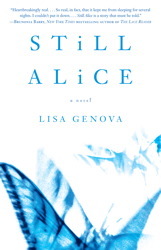 In the interim, various people kept asking me, "Have you read Still Alice yet?" I don't know why I didn't pick it up until recently. Maybe I was a little worried about the subject matter - Alzheimer's Disease - since that is something that I see often through work. Maybe I was a little worried about the "Heather's Pick" sticker on the front cover - I had yet to read a "Heather's Pick" book that I actually enjoyed unreservedly. Whatever the reason, I didn't pick it up until I threw it in my pack for the canoe trip earlier this summer when I was looking for paperbacks on my TBR stack to take with me. What makes a good canoe trip book? It should be entertaining (i.e. a good plot); not too challenging to read as I am usually too exhausted after a day of paddling and portaging to be able to focus on anything too tough; and easy enough to put down as my eyes drift shut in the tent, often before the sun has even set. This book met those criteria. If anyone hasn't heard of this book (unlikely, I know), Alice is a Harvard Psychology professor who is diagnosed with early-onset Alzheimer's Disease at the beginning of the book. Actually - that was my only accuracy issue with this book - I had trouble accepting that the thought of Alzheimer's didn't even cross her mind (given that she is a Psychology professor and familiar with most of the cognitive tests that were administered) when she began noticing problems. The book is not told in the first person, but it is definitely told from Alice's point of view. Which made for interesting reading, because as time passes, Alice's memory and cognitive abilities deteriorate. Alice's neurologist tells her early on that, "you may not be the most reliable source of what's been going on." I know that in healthcare jargon (and I've been guilty of using the phrase as well), this is called an "unreliable historian." Through the story, there are more and more holes that appear in the narrative as Alice's Alzheimer's progresses. I mentioned in my last post that my friend's e-reader died part-way through our trip, so we both ended up reading both of the paper books that I had packed (Little Bee came home slightly soggy, but Still Alice is still in good condition!). On discussing this book after we had both read it, we both agreed that Alice's husband was a bit of an a** in his dealings with Alice. However on reflection, I wonder how much of this was Alice's poor memory. It appears that he is springing a move from Boston to New York on her without consultation, but maybe there were hours of discussion prior to this but Alice doesn't remember them. Her children, on the other hand, are overwhelmingly supportive, even when she doesn't remember that they are her children. I'm sorry that I didn't read this book any sooner, and I'm glad that I packed it to take on this trip. And I can no longer say that I haven't enjoyed any of "Heather's Picks"! I plan on picking up the author's next book soon, entitled Left Neglected. This one is about a woman who sustains a brain injury and ends up with left-sided neglect - also something that I see frequently at work. I can't wait to see how she handles this neurological puzzle! Loved this "(I'm looking at you, Jodi Picoult!)" so true! I felt that about "Vanishing Acts"